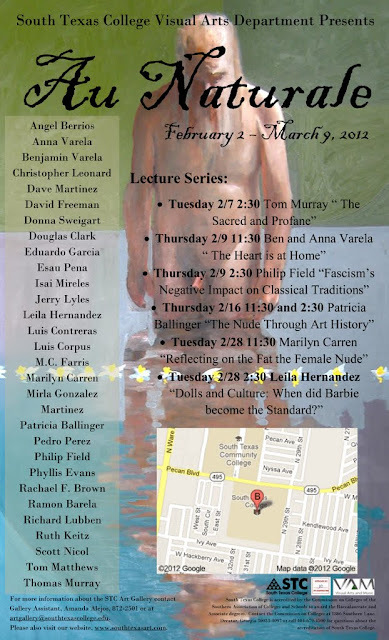 South Texas College is hosting the Au Naturale exhibition which will run until March 9, 2012. It is open for viewing Monday through Friday from 8:00 -5:00 p.m.
Spring 2012 Human Rights Art Exhibit: March 19th through April 13, 2012 at The Cooper Center for Communication Art Reception April 11th from 6 – 8 p.m.
Spring 2012 Juried Student Art Exhibition and Competition: April 26th through May 4, 2012 in B-103 with Reception April 26th from 6 – 8 p.m.
March 30, 2012 - 3rd Annual STC Student Composer’s Forum @ The Cooper Center for Communication Arts starting at 7:30 p.m.
April 12, 2012 - UTB Symphony Orchestra @ The Cooper Center for Communication Arts from 7 – 9 p.m. April 27, 2012 - STC Faculty Recital, J. Garcia, Guitar @ The Cooper Center for Communication Arts starting at 7:30 p.m.
April 30, 2012 - Jazz & Percussion Ensembles Concert @ The Cooper Center for Communication Arts starting at 7:30 p.m.
May 4, 2012 - STC Student Studio Recital @ The Cooper Center for Communication Arts starting at 7:30 p.m. 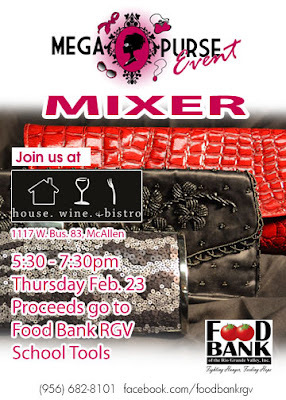 The Food Bank RGV will have a mixer for their Mega Purse Event tomorrow at House Wine in McAllen. 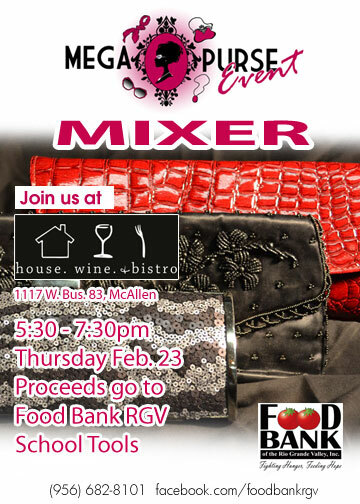 The mixer starts at 5:30, with proceeds going to Food Bank RGV's School Tools program, which provides school supplies to children. 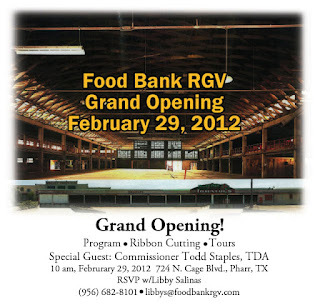 In case you wonder why the Food Bank RGV is giving school supplies, it's simple. Families having a tough time making ends meet should not have to choose between school supplies and food. All that aside, it's a great opportunity to have some wine and some laughs with good people. 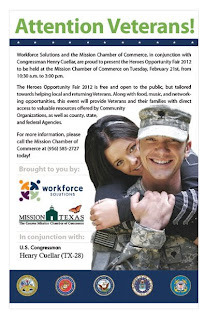 The Heroes Opportunity Fair 2012 is free and open to the public, but tailored towards local and returning Veterans. 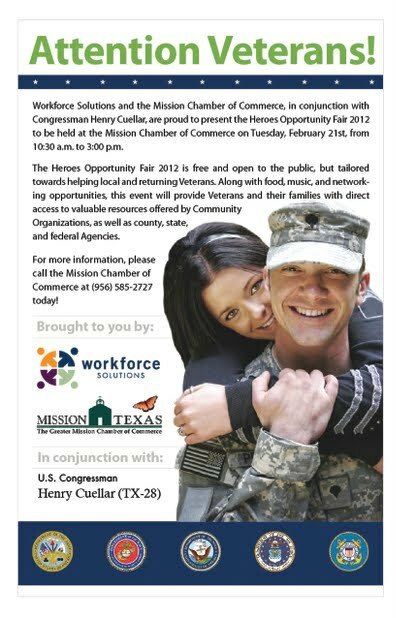 Along with food, music, and networking opportunities, this even will provide Veterans and their families with direct access to valuable resources offered by Community Organizations, as well as county, state, and federal Agencies. A little last minute, I know; but, if you can make it, go. WESLACO – The popular Onion and Salsa Recipe Contest returns to Texas Onion Fest this year at Weslaco City Park, to be held on Sunday, March 25th at the AEP Texas Culinary Center. Sponsored by H-E-B, the Onion and Salsa Recipe Contests have always produced uniquely delicious dishes year after year. Creativity is the name of the game, as last year's winners included Sweet Onion Jam with Goat Cheese Crostini and Butter Poached Baby Onion Tart. Texas Onion Fest has expanded to two days this year, allowing attendees the opportunity to experience all the major highlights, without having to miss anything. The contest will be held on the second day of the event at Weslaco City Park. The Culinary Center, sponsored by AEP Texas, will feature a state-of-the-art kitchen to be built on-site by Lowe's Home Improvement of Weslaco. Both contests will be held in front of a live audience at the event giving people of all ages the chance to show off their culinary skills and promote the use of onions in today's hometown kitchens. For the Onion Recipe competition, participants are required to use a ½ cup of onions in their recipe. The Salsa Recipe Contest adds a local flare to the event which requires participants to include a ½ cup of jalapenos. Find out if your homemade salsa is an award winning recipe! The contest honors the Mild Jalapeno developed in Weslaco by Dr. Ben Villalon. Competing age categories include Youth (ages 7–12), Students (ages 13-18), Adult (ages 19 and up), and Professional (restaurants, café's, cooks, etc.). 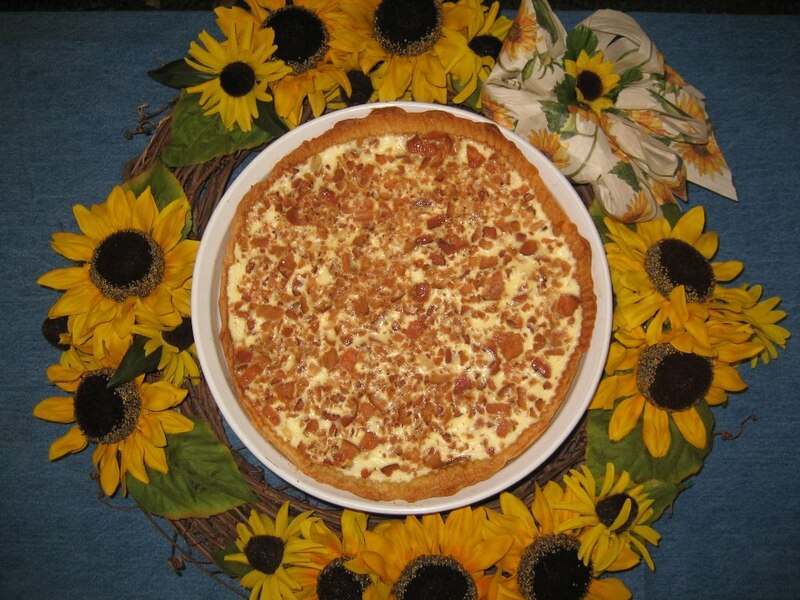 Winners will receive trophies and have their recipes published on the Texas Onion Fest website. 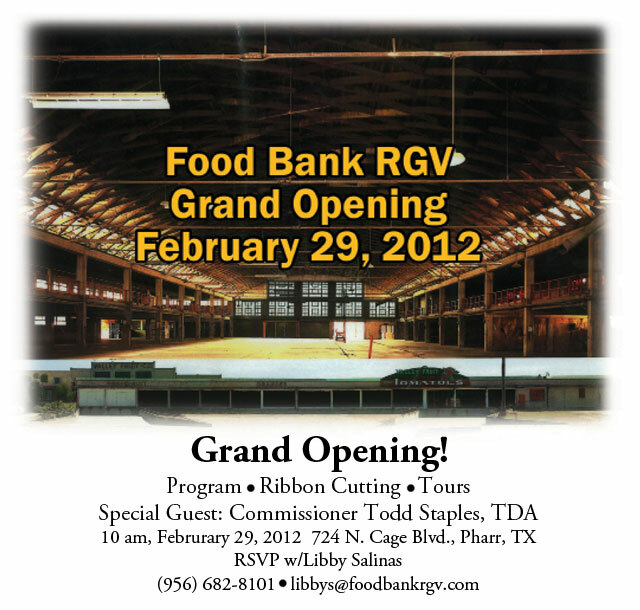 Entry forms are available at www.weslaco.com, and at the Weslaco Area Chamber of Commerce, 255 S. Texas Blvd. 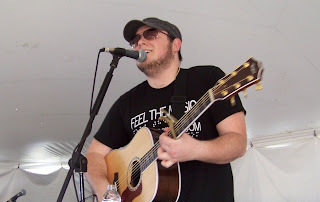 Registration deadline is Friday, March 16. 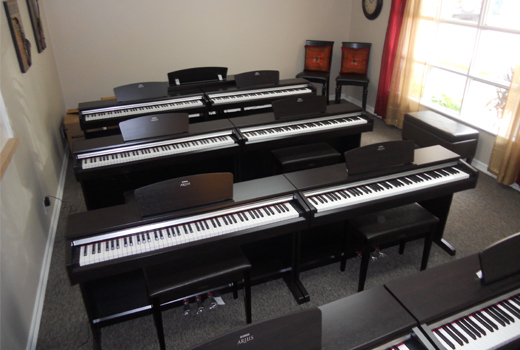 For more information, call (956) 968-2102. Next week, on February 25th, is the 9th Annual Mission Classic Car Show. The event will be held at the Mission Sports Park, which is south of the expressway on Shary Road, you turn East after a couple of miles. Admission to the Classic Car Show is free to the public. Doors open at 9 am and close at 5 pm. The show is for more than just gearheads. This is a great family outing with plenty of opportunity for taking pictures next to some great classic cars. If anything, it's a great opportunity for photographers looking for great material. Yesterday, my family and I were looking for one of those buckets that have a built-in mop wringer. Having seen all the Costco tents around the RGV signing people up, I figured they were already open. Nope; they will open in a couple months, that is in April. They are signing people up to a membership in advance to avoid the long lines on the day they open their doors. I don't remember the exact details; luckily I'm a blogger, not a journalist. Their memberships are a regular membership and premium one, costing around $50 and $120. The premium membership seems to be the greater value because you get 2% back on your purchases, which can pay for your membership the following year. However, if you simply want to save money on food and other goods you won't find at other retail stores, even the $50 membership can be a good value.